This tutorial has been a long time coming, I'm sorry it's taken so long to put together if you've been looking for it. I'm so glad I took the time to record the key steps as I did them, because now, 3 months later, there's no way I would have remembered all of the details! 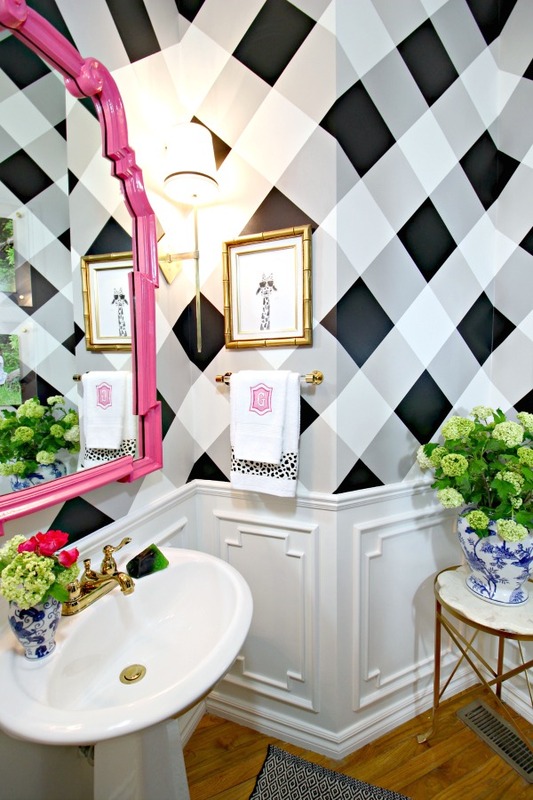 So many who scanned the reveal of my Powder Bath or saw it posted on Instagram commented about the wallpaper, which I guess is a compliment, but goodness... I worked hard painting that wall... wallpaper would have been a breeze! Honestly, though, it was worth it and I'm still so, so happy with the finished product! I don't want to make it sound too daunting, though. Yes, there is a lot of math and measuring and marking and steps involved, but it's a totally doable project with a big payout for not much of an investment- just time and paint. Turning the pattern diagonally and wrapping it around the room definitely added some difficulty (especially in this room that actually has 6 sides with a variety of weird angles), so if that's a little intimidating try a straight gingham pattern, even on one wall. Most of the steps here will still apply. I tried my best to explain everything clearly, but if you have a question about anything please don't hesitate to ask! 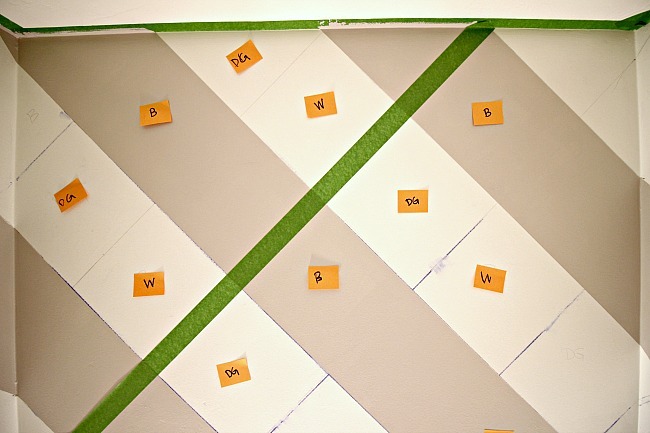 I started by taping cardstock up to determine scale of pattern and placement. My squares were 8" (I should have done one more step before proceeding with the 8 inch squares. I'll explain that near the end of the post). 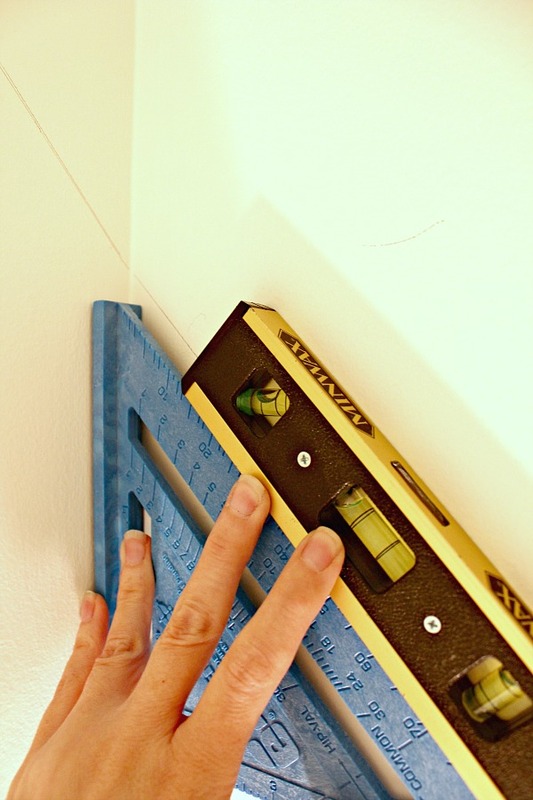 Be sure to tape off the ceiling (and baseboard if it applies) before starting. Mark the center of wall that's your starting point right against the ceiling, and then draw a 45 degree line going down and out from that center mark. 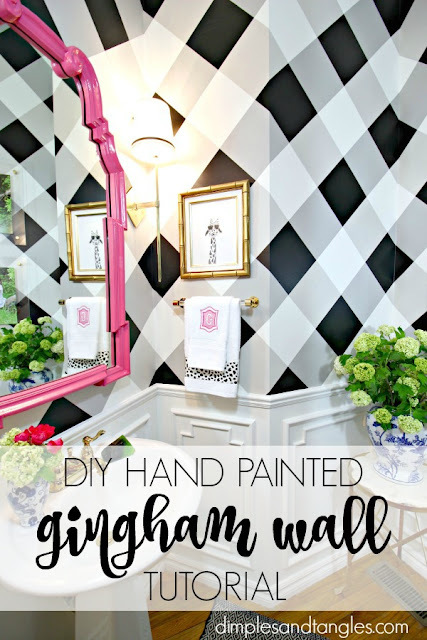 I started on the wall with the mirror since I considered that the main focal point of the room. 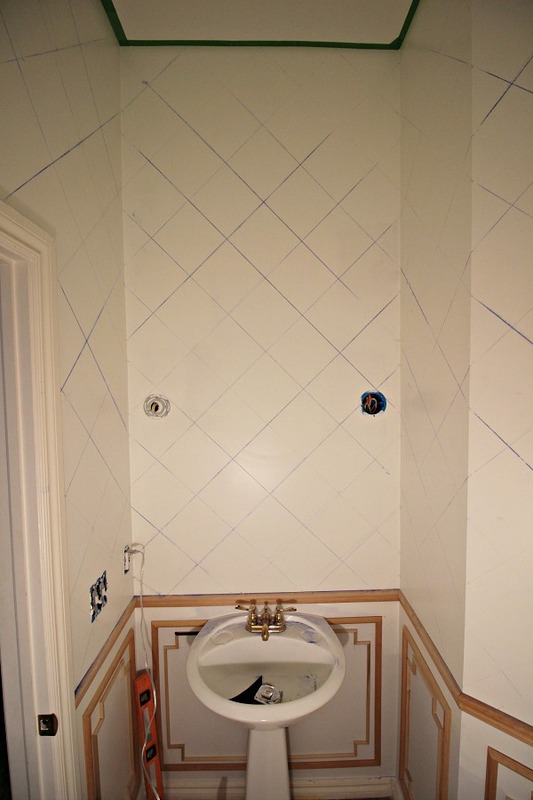 It was vital to use the blue rafter square along with the small level to make sure the starting marks I made were straight and level- you can't trust your walls and ceiling to be square! 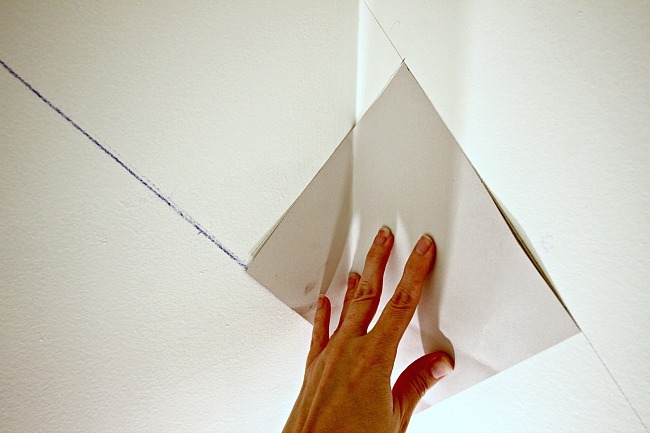 Use a longer level to draw the first diagonal line all the way down the wall. The rafter square will help to get the line right to the corners of the wall. Where the line stops in a corner, use that as a starting point to continue angle down the next wall, using the square and level again to make sure line is level even if your wall isn't square. If you look hard you can see my starting line from the top left all the way down to the bottom right. Find the measurement for the center diagonal of your paper sample square (when the square is folded in half on the diagonal). With my 8" square, the diagonal was 11.25". 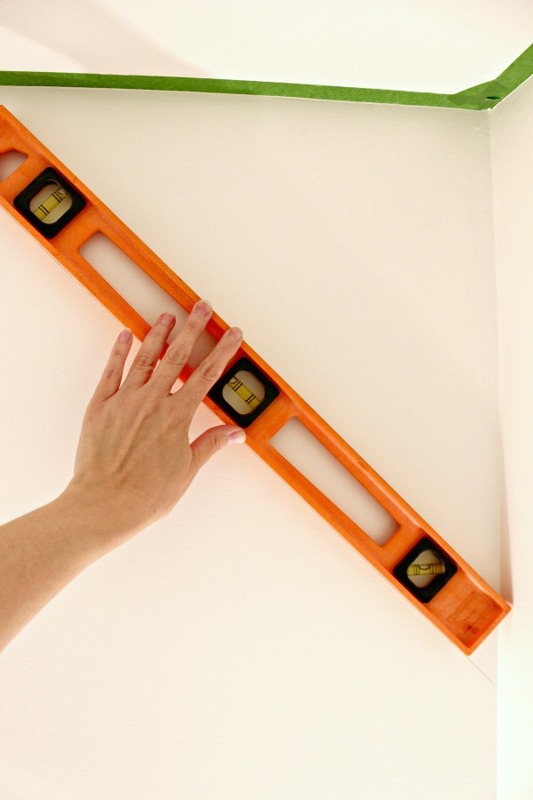 Go back to the starting point at top, and measure and mark that amount (11.25" for me) all around the perimeter of the room (when your squares are turned on the diagonal, this will be the measurement from one square to the next). 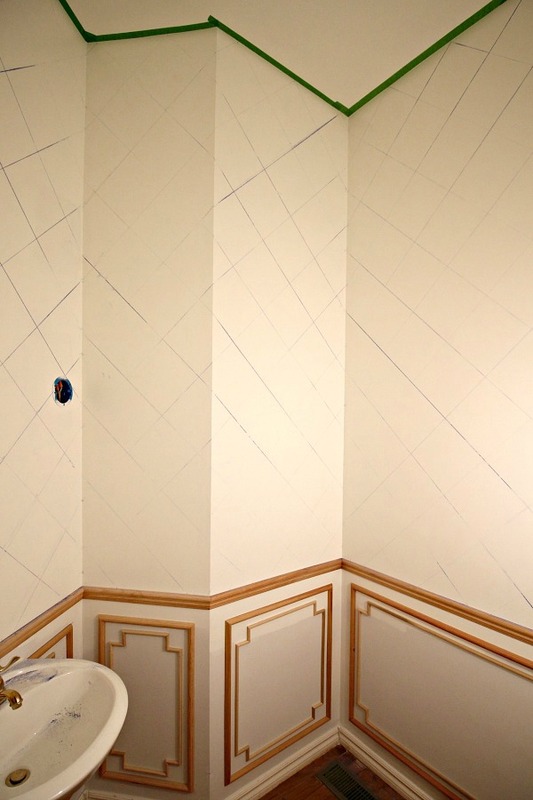 Do the same around the bottom, and if you're like me and wrapping the patterns around multiple walls, you'll need to continue that mark at each bend in the wall as well. 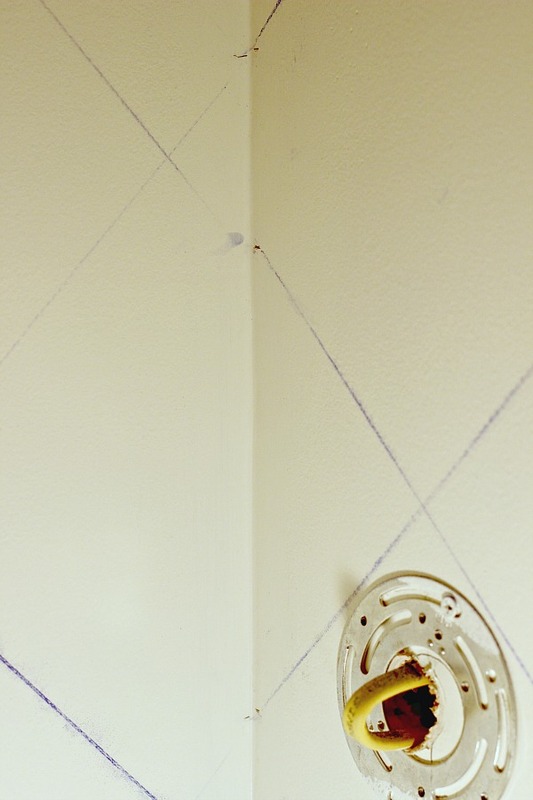 Also, figure out your marks vertically in each corner where the wall turns and mark those. Now, connect the dots to mark off the rest of your lines. 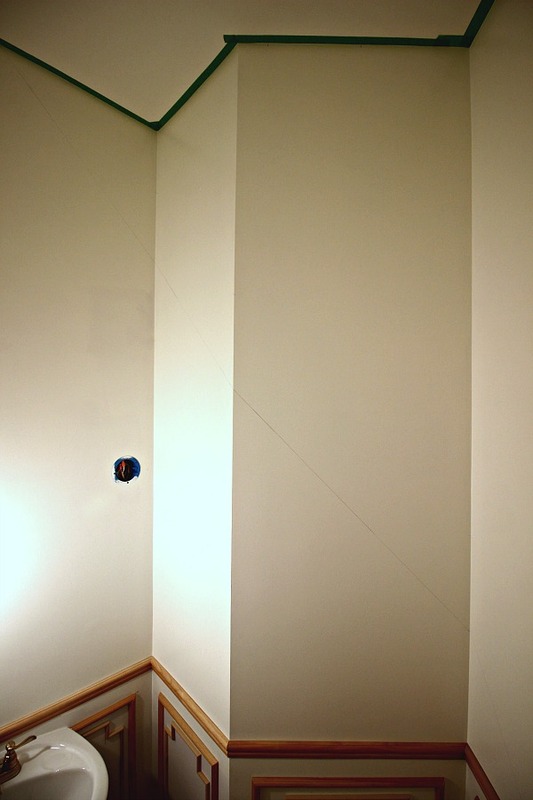 You can continue drawing lines with a long level or straight edge or laser level, but I used a chalk line, lining the string up at each end point and then snapping the line for a quick mark. When your pattern is all marked off, go enjoy a scoop of ice cream! You deserve it after all of that work! The hard part is done. 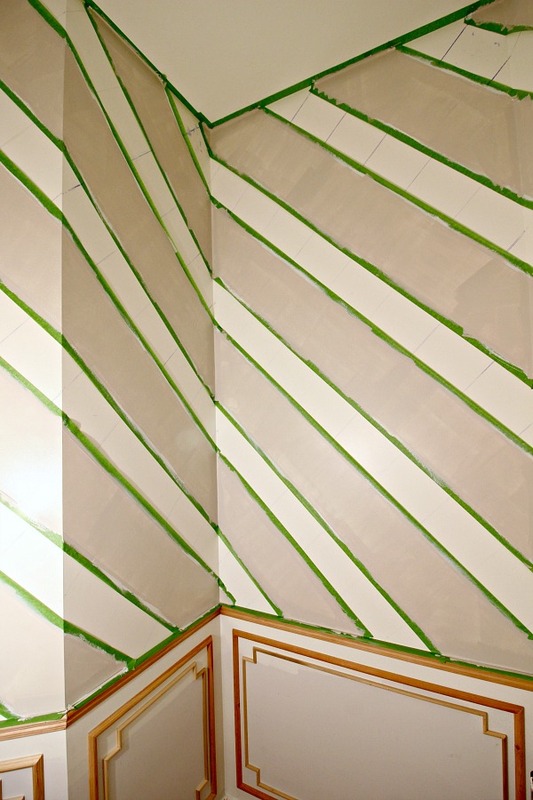 Now, tape off your lines for the first color you're painting, alternating inside lines and outside lines so that the stripe you'll be painting is 8" wide (or whatever your measurement is). I started with my lightest color first. Now, this is key! 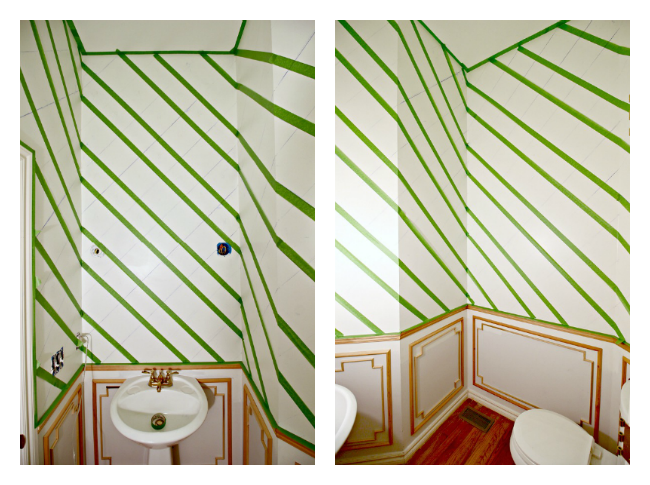 Even though Frog Tape or Scotch Blue (I used both) is really good, there's no way I wanted to do all of that taping and risk it bleeding under the tape if there happens to be an edge I didn't get pressed down well. 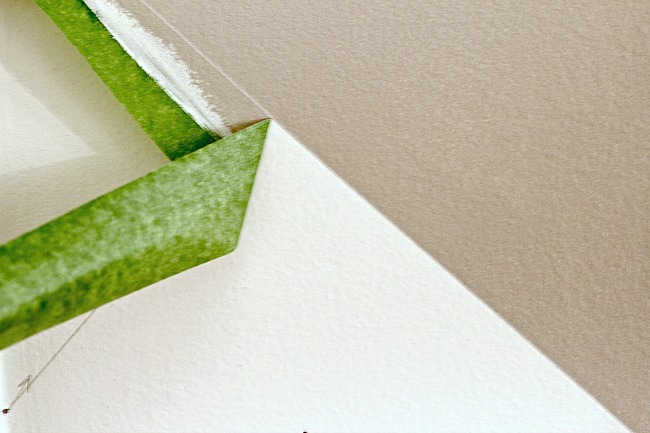 This simple extra step is totally worth it and is extra assurance that your lines will be super crisp and clean when the tape is peeled off. 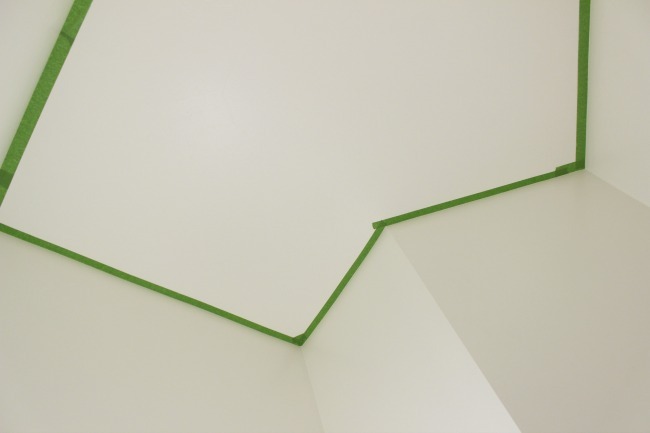 After pressing all of the edges of your tape down firmly, paint your base color around all tape lines, including the point around the ceiling and baseboards where it touches the wall (this means I painted a coat of the same white along the edge of the tape where I was about to paint light gray). 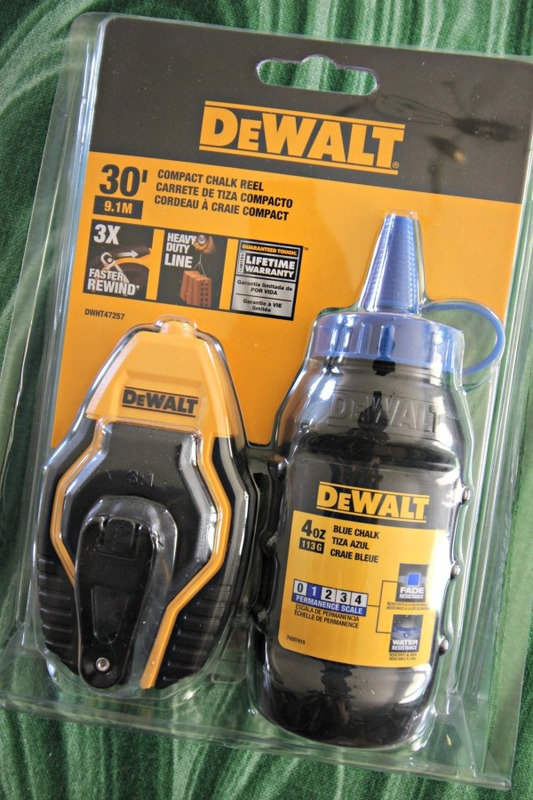 This doesn't need to be a heavy coat, just enough to coat the inside edges of the tape. 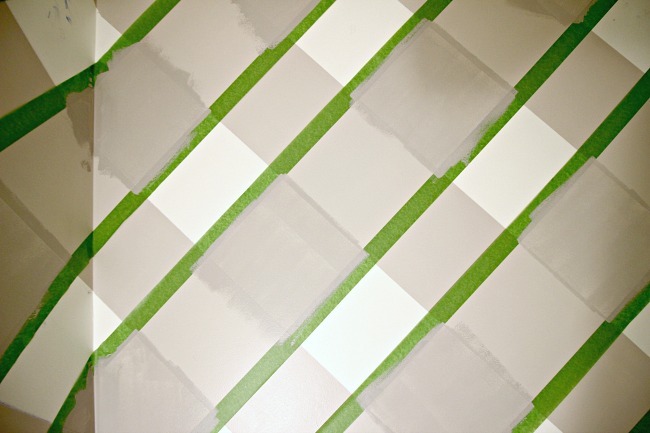 Doing this insures that if any paint bleeds under the tape, it's the same color as your base coat. Then, additional coats on top will not bleed through. I've used this tried and true method several times in the past (explained again in this post if you want to see more detail). Roll first color on alternating diagonal stripes. 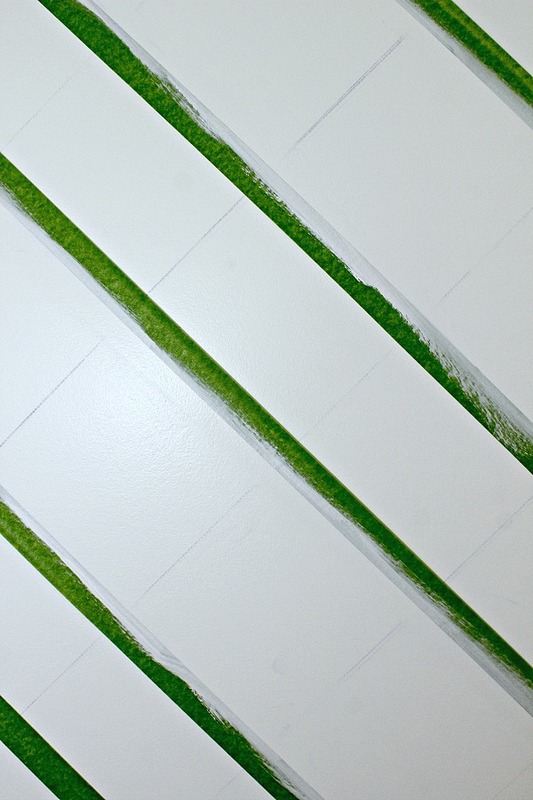 If using a light color, first wipe chalk lines off with a damp cloth with a squirt of mild cleaner sprayed on the cloth only inside the stripe that you're painting. 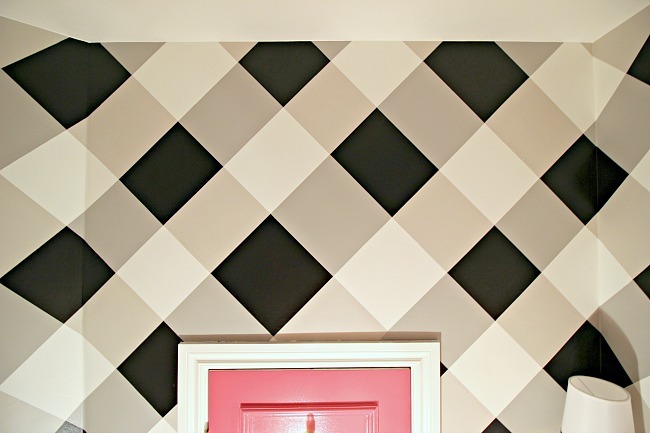 Apply a second coat if needed, if not peel tape off soon after you've painted before the paint dries. See, I told you the lines would be perfect if you take the time to seal the edges of the tape! 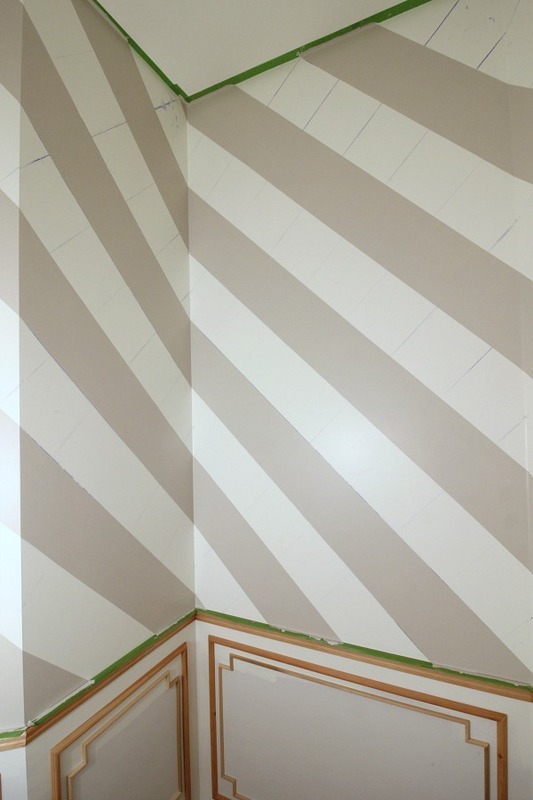 After the paint from your first color is dry, tape off the diagonal stripes in the other direction. I'm a visual person. A few color labels helped when preparing to tape for the second stripe color, just to make sure I was taping the right stripe off correctly. I did have to re-mark some of my lines that were covered by the first stripe, but just in a few places. 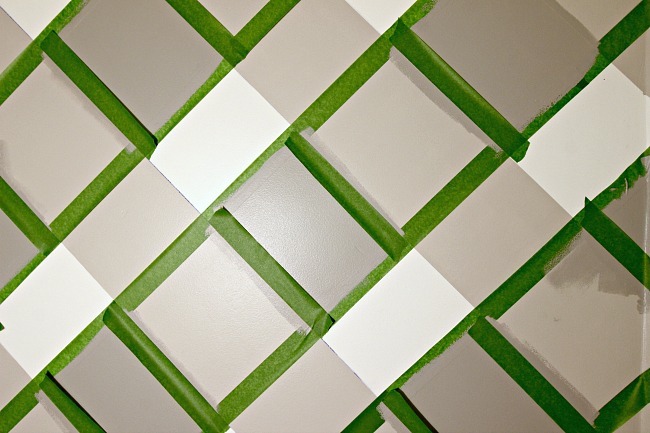 Since these walls are smooth and I was pressed for time, I didn't seal the edges of the tape this time since I would have had to do alternating colors of the base coat now, white and gray. I did still seal around the ceiling and the bottom, though. I double and triple checked that all of the tape edges I was painting over were pressed down very firmly. Thankfully things turned out ok for the most part, but there were a few jagged edges that I had to touch up with a small brush when the project was finished. This time I only painted over the squares that would be my 2nd color, not the entire stripe (the square I left unpainted will be my 3rd color- black). 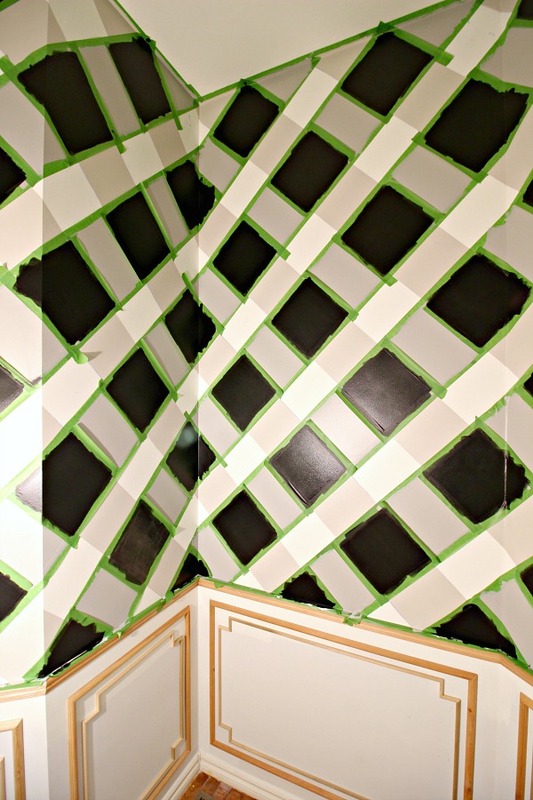 Apply as many coats as needed, but do not remove the tape this time after you're finished with this color. After recommended drying time, tape off the squares for the final color (black for me). 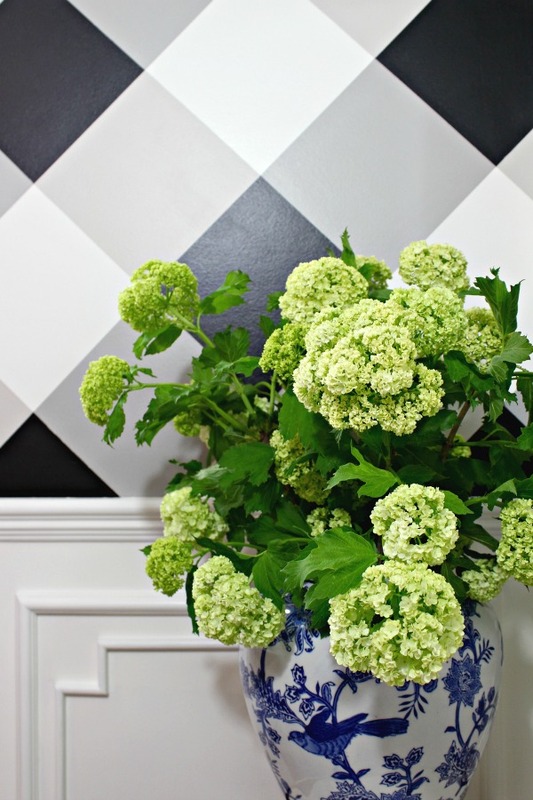 This will be the other square in the stripe you just painted. 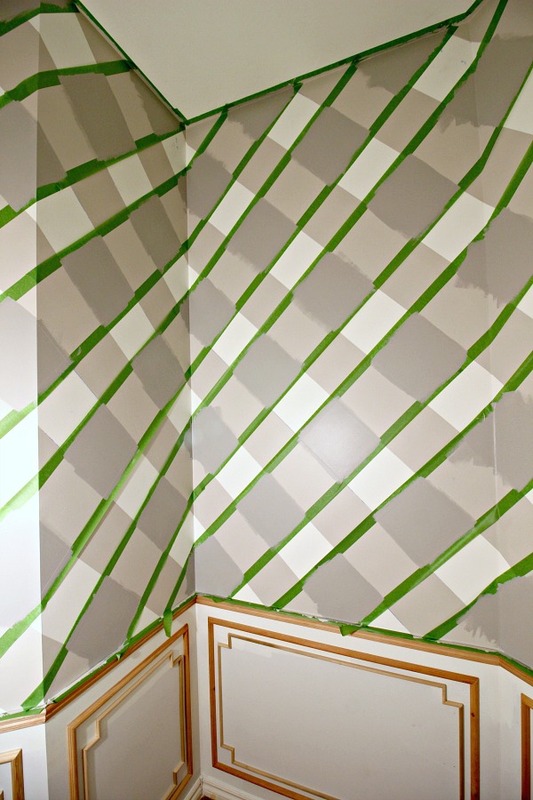 After your final coat is finished on your last color, peel the tape immediately and be amazed at your gorgeous walls! One note on clean-up: After I finished painting I still had some chalkline residue left along some of the squares. A light rub with a magic eraser removed it easily (be gentle, you don't want to mess up your fresh paint job). I still had some painting on the bottom half of the moulding and wall to do, so when that was done things REALLY started to come together. Now, in the interest of full disclosure, as I mentioned earlier, I did have one hiccup in my planning. Technically, I should have done a few more fancy math calculations and added up the perimeter of the room, then divided to find an exact even number for the size my squares should be (or something like that). 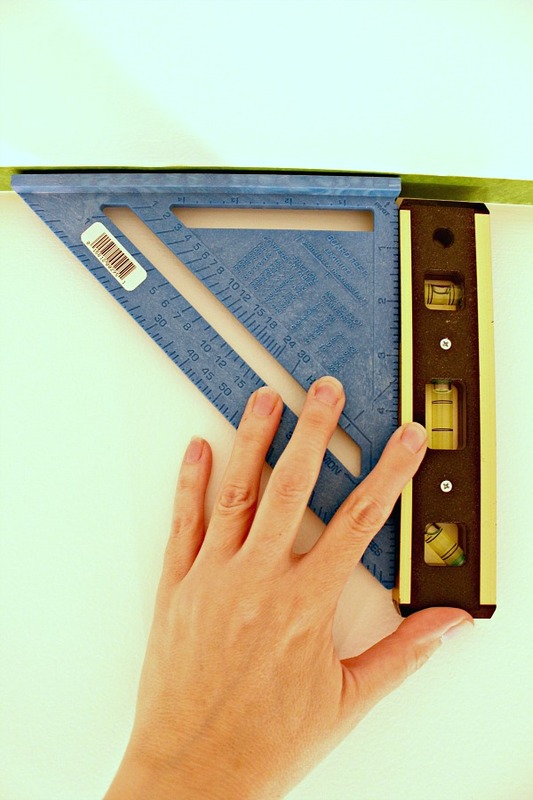 Instead, by starting out by deciding that I wanted my squares to be 8 inches, eventually when I worked my way around the room the measurements didn't line up exactly. 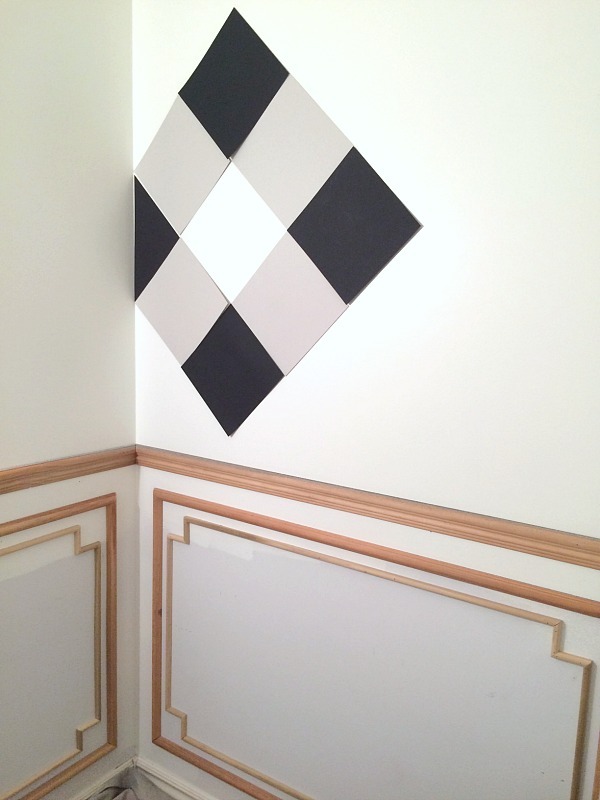 Once I realized my mistake, I was too far along to start over, so I had two choices- pick a corner where the pattern wouldn't line up (a point where the pattern would be mis-matched where two walls met), or I could adjust a few measurements in the most inconspicuous place possible. 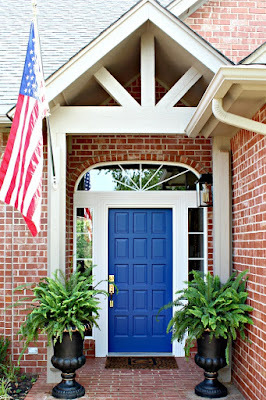 I chose option 2 and altered the pattern high above the door just a little. You can see how the stripes vary in size just a bit. I don't think it's too noticeable (except I just told all of you!) and was less obvious than a mismatched corner would have been. 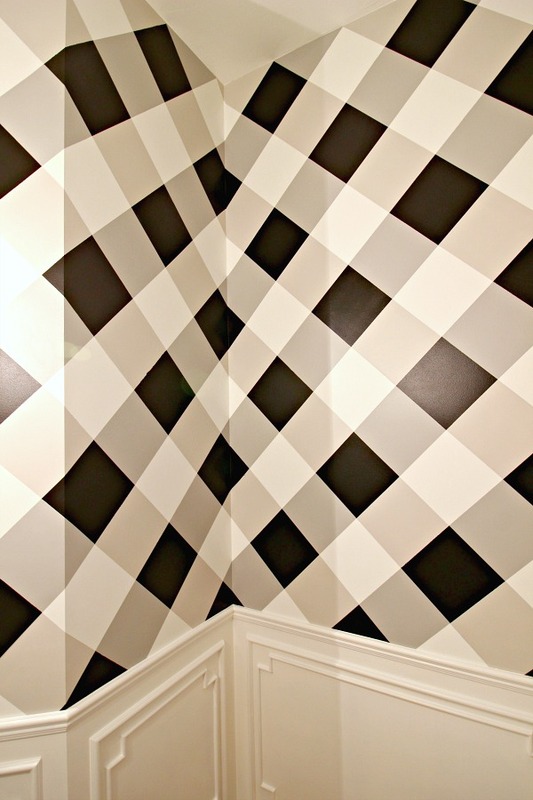 This wouldn't be an issue at all if you're only doing one wall, I just ran into the problem when the pattern needed to match the end to the beginning. I hope that makes sense! If you enjoyed this project and tutorial, I sure would appreciate a pin, thanks! It's amazing! So much hard work paid off! Jennifer, this is so incredibly beautiful! The math would have been tricky to begin with but all of your angles made it so much more so, I'm sure! You definitely aced this project. Great tutorial! I still can't get over how much I love this room!! Oh my word, so much work, but this looks totally amazing. WOW!!! I would never have the patient for something like this. Looks lovely and I love the pink accents. Amazing! I love how all your projects are so professionally executed and the results are always stunning. You are so creative and your problem solving skills are top notch e.g. Using mini hair clips for your faux orchid project. Your blogs are not only gorgeous but funny and real too. I'm still on the look out for a couple of ottomans to transform into one like your green beauties. I cannot imagine me doing this. You are truly a gifted person. I have been following you for sometime and I admire everything you do. Such lovely things you have created. 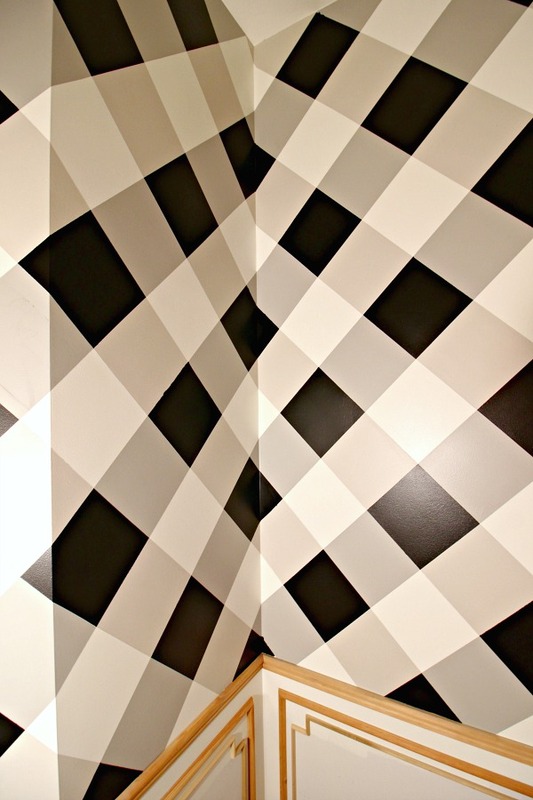 This has to be the most amazing dyi design in the history of the world! It is mind blowing. Absolutely exquisite . It should be on the cover of every design magazine. I would love to be able to see it in person. Bravo! I LOVE IT! 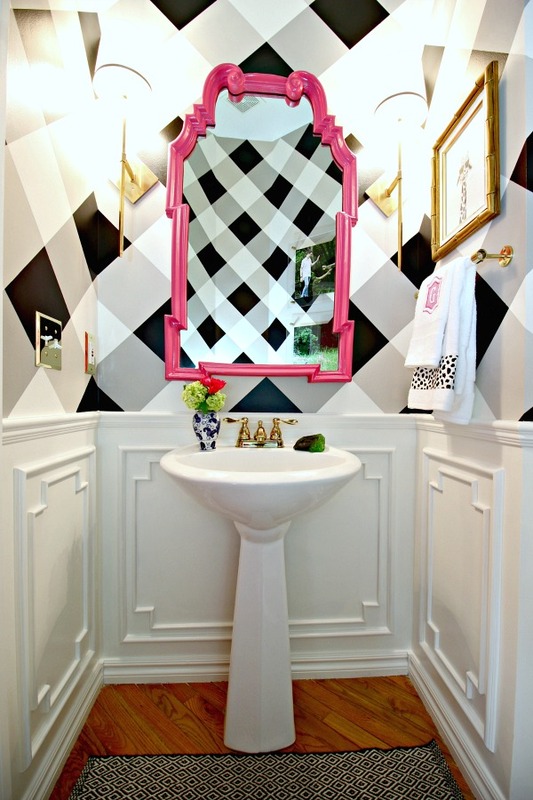 And I may "borrow" it for my powder room with the large blank wall. 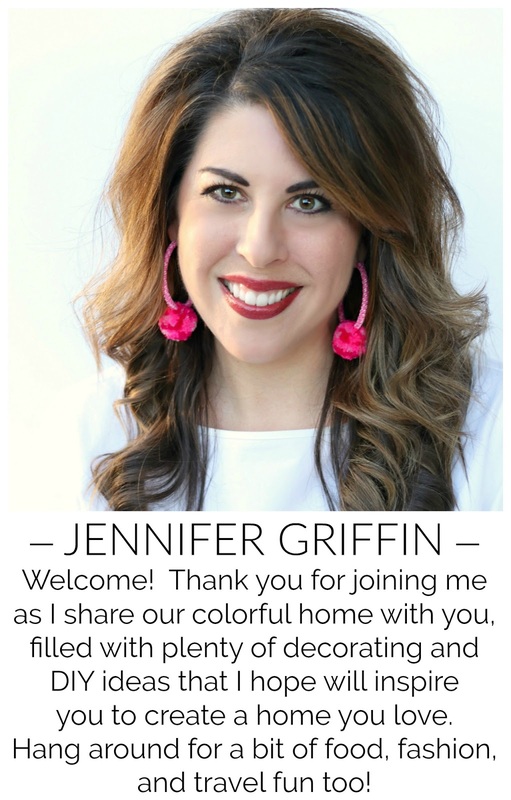 Bonus: pink is my favorite color and this is a way to use it in my home without my husband feeling overwhelmed with femininity! Thanks for the very thorough instructions. It's truly amazing and like nothing I've seen. A project worthy of a magazine spread for sure. And you topped it off with hot pink - the perfect touch. You're seriously amazing because I would definitely have quiet halfway through!!! Crazy awesome!! Thank you for showing us how you did it! Can you come to my house :) ....I love it! 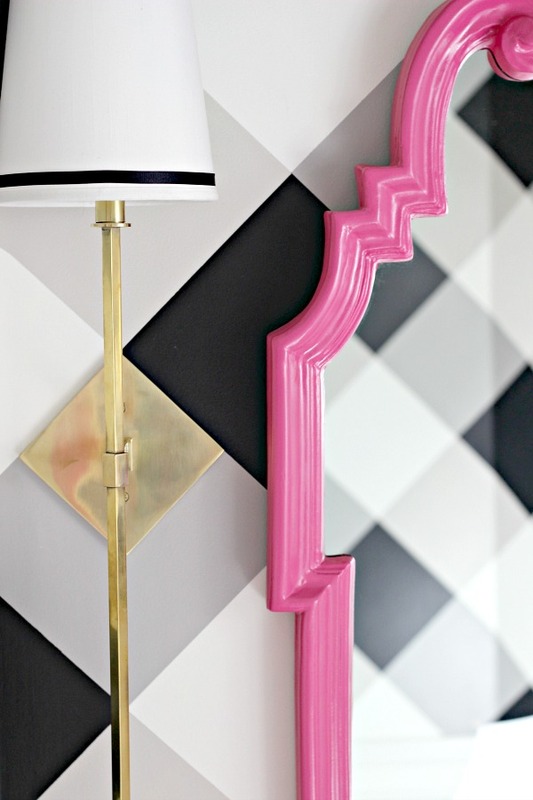 Ahhhhhhhmazing DIY. I pinned it for future reference and hope that one day I will have the time, patience and perseverance to pull this off. What an impactful statement it makes and the originality in vision and execution certainly sets you apart in the DIY/Blogging world. It's gorgeous, but you must have the patience of Job. :-) I love the color combinations.